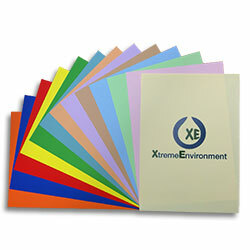 XE A3 vivid coloured shades offer the feel and performance of paper but with the strength and durability of a polyester film. Suitable for dry toner based digital mono and colour copiers and laser printers. Choose vivid shades for signage and notices requiring high visibility such as warning and safety notices. Perfect for vibrant labels, posters, flyers and colour coded communications, etc. Choose Pastel shades for document separators, tags, colour dividers, manuals, restaurant menus, charts, etc. Ideal for high visibility labelling and warning signs. No lamination required!